Apart from milk, the water, flesh and nut of the coconut can be used in cooking to yield a nutritious, naturally sweet dish. Remove the top of the coconut and keep it as a lid. Drain off the coconut water, but do not remove the flesh. Place the coconut in a fairly big bowl. Fill the bowl with enough water to cover more than half the coconut. 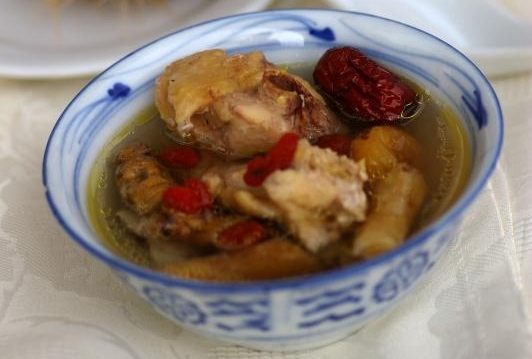 Scald the chicken in a pot of boiling water. Rinse the herbs, kei chi and dates. Put the chicken together with herbs, berries, dates and salt in the coconut and pour in the hot water. Cover coconut with the lid. Place the bowl with the coconut into a steamer and steam over simmering water for about 2 hours. Serve the soup in the coconut or transfer to a serving bowl.